One of my struggles over the last couple of decades has been to find a music magazine that matches my own musical tastes. In my teens, when my musical tastes were being forged, the magazine of choice was the weekly ‘wacky thumbs aloft’ Smash Hits, edited for a time by PSB-er Neil Tennant. 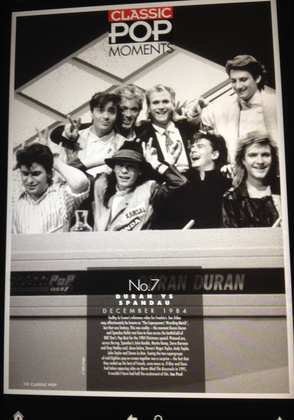 It had a rather irreverent style that matched my teenage outlook but was bright and colourful as that decade dictated and gave me weekly single and album shopping tips as well as interviews, nice posters for the wall and more importantly (at that time) song lyrics to enable you ruin any song by singing along to it. 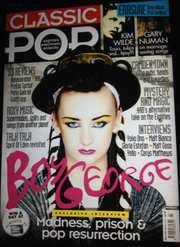 Classic Pop is a music magazine for my generation and covers my era of music. It’s big and glossy in its print form, but I’ve recently switched to the electronic copy which I download to my Kindle Fire HD via an application called Pocketmags. So here we are at Issue 7, so what’s in it? Well the main focus is the 80’s, of that let there be no doubt, but it is modern in its outlook and tries to bridge the gap between that decade and the modern era, highlighting new bands that may be of interest as well as looking at all our old favourites either back in the day or what they may be up to now. As the magazine has developed over its short history the quality has gotten better and better and so this issue is the best so far in the print run in my opinion. 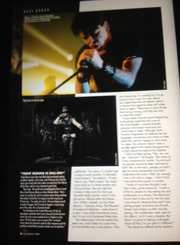 Interview wise the highlight is a rather intense and personal interview with synth pioneer Gary Numan on the eve of his new album Splinter, reviewed on another page and pronounced as his best album in 30 years. The depth of detail in this interview is nothing short of brilliant and it is to both the magazines and Numan’s credit that the interview is much much more than the usual glossy PR-style piece that so often masquerades as an interview in the mainstream press. Actually the same goes for an interview earlier in the magazine with 80’s gay icon Boy George, also returning with a new album that is coincidentally also reviewed. Boy George and Culture Club were never one of my favourites, the only song of theirs I ever liked was Victims and even then it was more a grudging liking and would never have bought it. Still, I have some respect for the man after following his escapades over the years and struggle with drug addiction and this interview again holds nothing back. There’s also an interview with possibly my first real crush and horticultural phenomenon Kim Wilde, who dissects her career whilst also talking about her happy marriage and family. And the icing on the cake for some would be the article on Roxy Music from their glam beginnings to smooth end with the classic album Avalon. There’s also an indepth examination of the 4AD label, home to Cocteau Twins amongst others, and the last Talk Talk album Spirit of Eden. The latter is an interesting look at an album that some consider a classic but that I really can’t get my head round, always preferring their more synth-laden trio of earlier albums. Finally in a regular look at the geography of pop there’s a piece on Camden Town with Madness as hosts but acknowledging other bands from around the area. As you would expect there’s also the ubiquitous Reviews section that covers new albums by familiar artists, reissues and new band releases that may interest fans of the 80’s. Live reviews in this issue focus on the Rewind Festivals but aren’t limited to that. 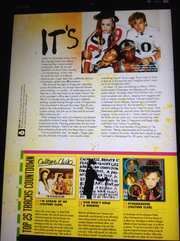 This is a quality magazine that is focused on the only decade that matters. It’s not limited to any genre and covers them all in some form, even initially (and to its detriment I feel) wearing its political views on its sleeve. The latter seems to have calmed down a little and settled into a quality read for anyone interested in the decade’s music.